Tabby Tommy, who had been missing for two weeks, has been reunited with his owner thanks to Cats Protection’s national Facebook page. 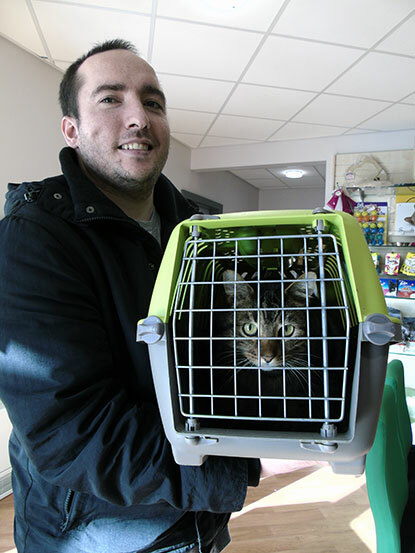 Tommy was handed in as a stray to our Warrington Adoption Centre by a member of the public. 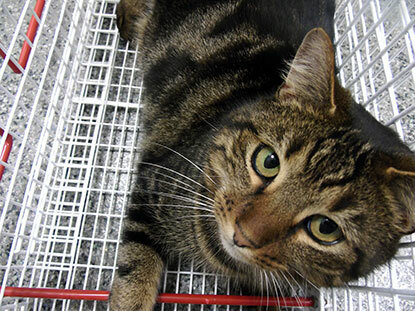 Upon scanning the cat for a microchip, the adoption centre staff found that he was registered to an owner over 200 miles away in Torquay, Devon. However, the owner’s details were not up-to-date so the centre couldn't get in touch with them. They advertised the cat locally to try to find his owner, sent a letter to their previous registered address and reported Tommy as missing with the microchip company. It was only when Tommy’s photo and story were shared on our national Facebook page to over 350,000 people that someone got in touch to say that Tommy was theirs. Tommy’s happy owner picked him up from the adoption centre yesterday. Deputy Manager Anna Saillet says: “Tommy had been found very close to where he lived. Tommy’s poor owners thought he must have been killed on the road and have had two weeks of upset. “They have been advised to ensure that they update his microchip details as soon as possible to prevent the same thing from happening again. Also please tell owners who go to the trouble of chipping their pets to check with the chip company that THEIR details are also registered.my daughter found out after six years that her dogs details were NOT registered with her chip.!!!! she only found out because she moved house and was contacting the chip company to update her records,so had her dog gone walk about even chiped their was NO details to contact her owner,!